What are the differences between reclaimed, rough sawn and distressed furniture? Reclaimed wood furniture, rough sawn, and distressed all offer a look that’s a little worn and broken in, but there are distinct differences. Learn more about Reclaimed and Rough Sawn in our blog Reclaimed vs. Rough Sawn or explore all things rustic on the rustic furniture style page. Reclaimed barnwood, or barn wood, is sourced from century-old barns in Ohio. This authentic weather-worn character makes for a beautiful finish to the eco friendly barn wood. Explore our Reclaimed Wood Furniture collection. There’s both natural and simulated rough sawn lumber. When raw lumber is cut, the blade used can leave either a straight mark or a mark with an arch to it. Instead of planing down these marks for a smooth surface, they’re left in. This is natural rough sawn lumber. Simulated rough sawn furniture intentionally creates these marks in standard lumber to create a unique rough sawn lumber look. Find ruff sawn furniture for your home here. For distressed wood furniture, different techniques are used to create a time worn, aged appearance, or vintage look. Woodworkers use tools on the surface of the wood to create marks like pinholes, indentations and nicks that simulate decades of use. 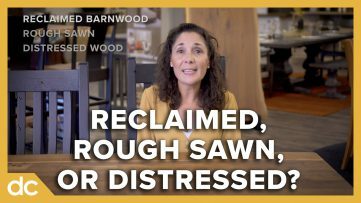 Learn more about furniture distressing in our distressed wood video. Both reclaimed wood and distressed wood can fit the category of industrial style furniture when paired with wrought iron. Industrial style is known for combining iron accents with rugged, worn wood finishes. What are the differences between reclaimed, rough sawn, and distressed wood furniture. Reclaimed, rough sawn, and distressed furniture all offer a look that’s a little worn and broken in but there are distinct differences. Reclaimed furniture is made with wood salvaged from old barns: often pine or oak wood. The wood undergoes a thorough cleaning process, all the nails are removed, and the wood is kiln dried to eliminate all pests and to achieve an ideal moisture level. Reclaimed furniture is eco-friendly, it’s made with existing wood that’s repurposed instead of being thrown out and sent to a landfill. Reclaimed furniture is rugged and natural. Think of barns standing on the countryside, some for a century. There are nail holes, sun spots, wormholes, and knot holes. Initially these are left open, but they can be filled with epoxy for a smoother finish. Reclaimed furniture is often finished with a clear stain and no two pieces will be the same. Years of weathering and wear truly create an authentic character for reclaimed furniture. Rough sawn furniture is a type of distressing. There’s both natural and simulated rough sawn lumber. Here’s how it works when raw lumber is cut. The blade used can leave either a straight mark or a mark with an arch to it. Instead of planing down these marks for a smooth finish they’re left in. This is natural rough sawn lumber. These same marks and imperfections can be made on regular lumber with special tools. This is a simulated rough sawn lumber. Whether natural or simulated, the marks made in the wood hold a stain differently and draw attention to themselves. Rough sawn furniture embraces it’s distressing with simple designs like large flat areas, straight edges, thick legs, and thick tops. Without reclaimed furniture’s exposure to the elements, rough sawn lumber offers a more uniform look with less variation in color. Rough sawn works for both rustic collections and contemporary collections as well. For distressed furniture different techniques are used to create a time-worn, aged appearance or vintage look. Woodworkers do special tools on the surface of the wood to create marks like indentations, nicks, and pinholes that simulate decades of use. Special sanding and scuffing techniques are used to create wear points and eased edges. These manually created signs of wear create a unique character for distressed furniture and give you more control over the finished product than you have with reclaimed furniture. Watch our distressed wood video for more information on distressed wood techniques. We’re happy to offer several options for rustic looking furniture, but this could make it more difficult to choose. Do you value authenticity and environmental sustainability the most? Go with reclaimed furniture. Do you prefer an industrial style with a more uniform finish? Rough sawn furniture could be the pick for you. Or do you want traditional furniture designs and options with a certain degree of wear in the finish? Go with distressing. Which do you prefer?